You’ll be sending your first email marketing campaign within 30 minutes. Create a list, add optional fields, import contacts, create your email template with the WYSIWYG Email editor or upload an existing design, then send and analyze results. Pinpointe On-Demand gives you the features you need to maximize results. Behavioral targeting lets you select prospects based on actual, recent activity, while advanced segmentation features allow you to create segments based on any number of custom fields. Dynamic Content Blocks. 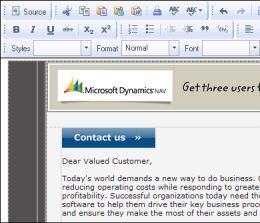 Dynamic content blocks allow you to personalize a section of your email messages based on custom field values. Email Inbox Previewer. Our email previewer shows how your email will look in all of the popular email clients (Yahoo, Gmail, Hotmail, Outlook, etc). Split Testing. Find out which of your email campaigns performs the best based on open rates and click-thru rates with split testing. Drip-Marketing Campaigns. Create multiple autoresponder and trigger emails for each contact list. Triggers can also move contacts from one list to another, based on their activity. Surveys & Feedback Forms. Use the drag & drop editor to quickly create a customized survey then link to it in your email. We’ll help to ensure your campaigns are CAN-SPAM compliant. If you forget to include an unsubscribe link, we’ll insert one for you automatically. People who unsubscribe are qutomatically flagged so you can’t accidentally re-send to them. You can even add ‘Do Not Mail’ suppression lists. Finally, keep your list clean – we’ll automatically generate a double opt-in email automatically when users sign up using Pinpointe’s website integration.